One Ripper Free Pokie by WMS is the Fire Queen Slot Game. Fire Queen is a creation of WMS which is a cracker company that makes Aussie style poker machines aka “pokies” as the locals call them fondly. It is part of their Double Money Burst online slot machines. To this end, it does not feature conventional reel layouts but instead sports 3 sets of reels (total of 11 reels) and a hundred paylines (50 paylines on top half and 50 paylines on bottom half of your screen). Reels are in 2×2 and 3×6 sets. At first, this online slot looks like it has a complex interface. However, once you get used to it, you will love its simplicity. This game is based on Fire Queen, who is charged with protecting her land and its treasures. Like its name, you will see the element of fire as you play. All symbols are theme related. They include jewelries, rings, fire globe, potions, flowers, candles, phoenix, fire cards and Fire Queen herself. There are also poker card values representing low rated symbols. Have a free play of the bonza Australian style poker machine right below Fire Queen or have a burl on the Dragons Inferno pokie. All 100 paylines on this online slot are fixed. This means that to play, all you have to do is set your bet amount. For every two lines on your reels, you bet one coin. To this end, lowest bet amount is pegged at $0.50 and maximum bet at $100. There is a 200-spins customizable auto-spins feature for the lazy punters. 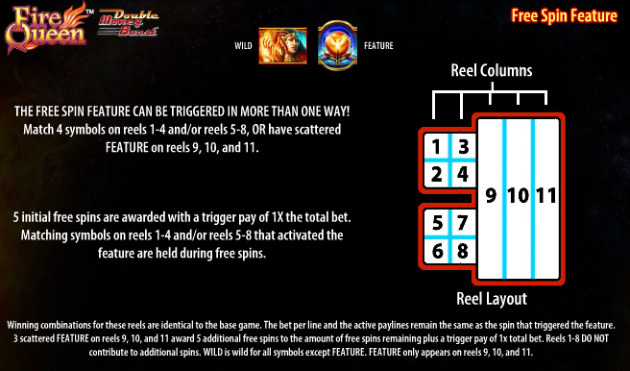 Fire Queen is offered with a number of special features including wilds, scatters, free spins and multipliers. Fire Queen herself acts as a wild symbol. She substitutes other symbols, with an exception of scattered Crystal Ball, to complete winning combinations. Not only does she replace other symbols and up your chances of hitting winning combinations but she also works in an interesting way to bring you even more wins. If she appears on any of 2×2 reels, she changes into a transferring wild and can transfer from there to any of the other reels. If she appears on ninth, tenth or eleventh reel, she expands to fill all three reels. This online slot comes with free spins and multipliers. You will be awarded 5 free spins for landing 4 Crystal Ball symbols on 2×2 reel set or on reels 5 through 8. To be awarded 20 free spins, you have to land Crystal Balls on all 2×2 reels then land three extra Crystal Balls on 3×6 reel set. 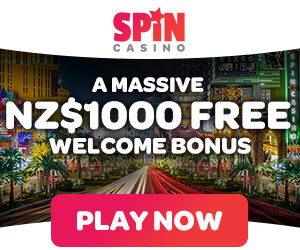 Besides 20 free spins, you will be awarded multipliers up to 100x your stake. Fire Queen may have an intimidating reel layout for newbies. Nevertheless, it is offered in English and other European languages to make it fit for players from all over the world. Dialogue windows, captures and all sections of this game are multilingual. You can play this game on your browser if you have a flash player or you can download it. It offers basic user settings such as sound settings. Fire Queen online slot presents players with 96.95 percent return to player rewards at many casinos. It does not feature a progressive jackpot but it still gives you a chance to win great. It has a great sound which makes it very different from other video slot machines online. It is offered with only 4 percent house edge and enables you to win up to 100x your stake. Google + Profile: Tina Lim on January 14, 2016. on September 9, 2016.